Geography: Hong Kong Island + Kowloon (Kowloon Peninsula) + New Territories (including Lantau Island and 200 other outlying islands). Currency: Hong Kong Dollar, pegged with the US Dollar at around HKD$7.8 to USD$1. Timezone: GMT+8, same as Mainland China, Taiwan or Singapore. Voltage: 220 Volt, 50 Hertz. Taxes: Hong Kong does not have sales tax / GST / VAT. Weather— For those who are seeking warm, dry and sunny weather, the ideal time is October to December.Those who are wanting to escape the humidity of tropical climates will appreciate the cooler months of January to March. The temperature ranges from 9°C to 24°C during winter, and from 26°C to 33°C during summer. The humidity is typically high in the spring and worse in the summer, when high temperatures (usual maximum of 32-34°C) are often recorded. Events — During Chinese New Year, whilst there are some extra celebratory events such as a lion dances, fireworks, and parades, many shops and restaurants are closed for three to five days. The official public holiday lasts three days. There is a second round of cultural activities in the autumn lasting till the end of the year. Christmas is also a nice time to visit as many stores and shopping centres are nicely decorated and the festive mood is apparent across the city. 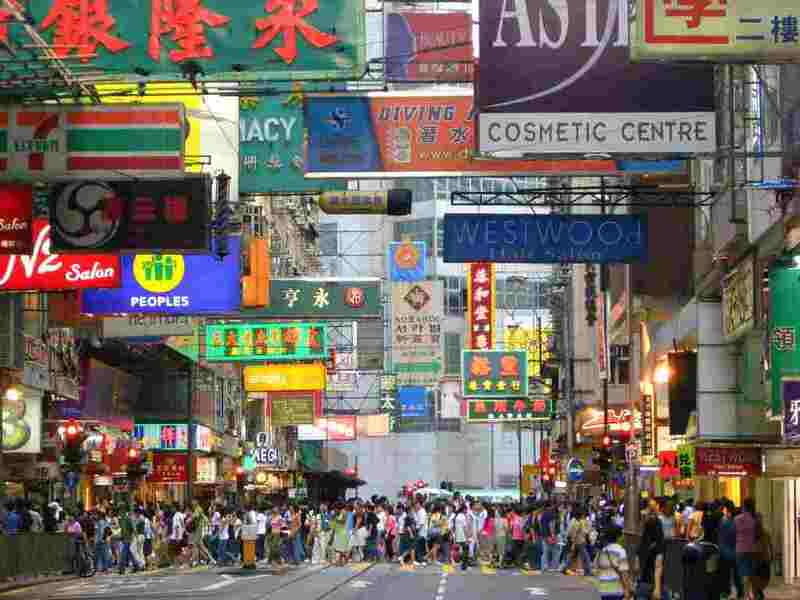 Hong Kong is the perfect place to pick up a unique bargain or indulge in an unexpected extravagance, if you know exactly where to look. The map below shows the major shopping areas throughout Hong Kong. Hong Kong has a lot of street markets. Some of them just selling regular groceries, others clothes, bags or even electronics. Many stores in Hong Kong (even some chain stores) are willing to negotiate on price, particularly for goods such as consumer electronics. Always feel free to ask "is there any discount?" and "do I get any free gift?" when buying anything in the territory. You can often get an additional discount if you pay cash (since the store can avoid paying the credit card charges). Hong Kong Disneyland opened on September 12, 2005. It is on Lantau Island, about 12 kilometers east of the Hong Kong International Airport, and may be reached via the MTR Disneyland Resort Line from Sunny Bay Station (note that to get to Disneyland from the airport, you must make two connections, the first at Tsing Yi and the second at Sunny Bay; in this case it probably would make more sense to take a taxi). Though significantly smaller in size than other Disney parks elsewhere, it does offer some great attractions ("Festival of the Lion King" stage show, "Golden Mickey's" stage show, "Mickey's PhilharMagic 4D" show) and very short queues most of the year (except the week of Chinese New Year). 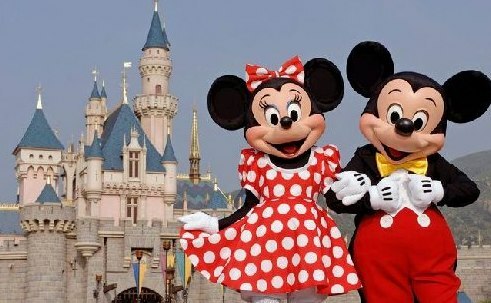 Disneyland has not been as successful as anticipated and reports in the South China News indicate that it has failed to reach its visitor numbers by as much as one million people. It's not all bad, though - a second theme park should open next door in the near future. 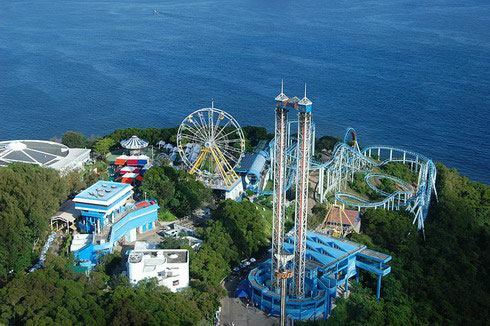 Ocean Park is on the southern side of Hong Kong island. With roller coasters and large aquariums altogether, it's still packed on weekends with families and tourists after opening to the public for 30 years. The cablecar is an icon and an essential link between the two parts of the park. The views of the South China Sea from the cable car is always terrific. It would be fair to say that many local people would choose Ocean Park if they had to pick a single theme park to attend. For many, the chance to see Hong Kong's pandas would be a deciding factor. Young adults will be attracted to the wider range of rides. You can get to Ocean Park by a direct bus ride from Admiralty MTR station; it will be the first stop after you clear the Aberdeen Tunnel. 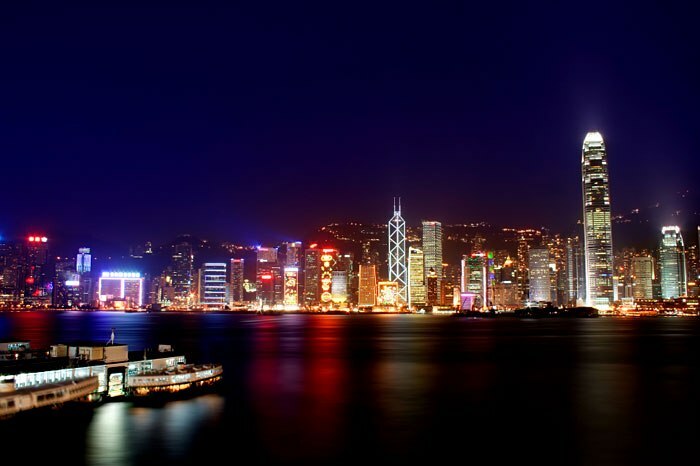 Get a stunning view of Hong Kong Island on Victoria Peak with the giant, wok shaped Peak Tower. Within the building are shops, restaurants, museums, and viewing points. The Peak Tram runs from Central to the bottom of the Peak Tower. Although the view of Kowloon and Victoria Harbour can be good, be prepared for the view to be spoilt by air pollution. There is no point in spending the extra money to visit the observation deck of the Peak Tower. There are a number of nice walks around the peak that quickly leave the tourist area behind and offer nice views of all sides of the island. You will be able to catch a laser show at 8pm every day. You are never far from the sea in Hong Kong and going to a good beach is only a bus-ride away. 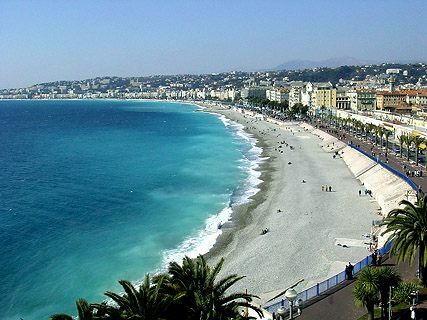 However, if you want a really good beach, then it is worth making the effort to travel, possibly on foot, and seek out the beaches of the New Territories. Hong Kong's urban beaches are usually well maintained and have services such as showers and changing rooms. Where beaches are managed by the Leisure and Cultural Services Dept. shark nets and life guards are present. Dogs and smoking are not permitted on these beaches. Perhaps the number one highlight of Hong Kong is the cuisine. Not only is it a showcase of traditional and modern Cantonese cuisine, the various regional cuisines from around China, such as northern Chinese, Chaozhou and Sichuan are all well represented. There are also excellent Asian and some fairly good Western restaurants as well. Residents tend to eat out a lot more than in other countries. Because of this, eating out can be fairly cheap, as long as you stick to local restaurants, and avoid the often overpriced Western counterparts. While dining out, it is easy to find places offering mains for well under $80 offering both local and international food. Fastfood chains such as McDonald's and Café de Coral offer meals in the vicinity of $20. Mid-range restaurants generally charge in excess of $100 for mains, whilst at the top end the city's best restaurants can easily see you leave with a bill in excess of $1200 (including entrées (appetizers), mains, desserts and drinks). Above all, Hong Kong is known for its dim sum (点心), delicately prepared morsels of Cantonese cuisine served from a never ending procession of carts and eaten with tea. Dim sum is usually eaten for breakfast or lunch and is often the focus of family get-togethers on Sundays. An excellent place to go for dim sum is City Hall in Central - just be sure to ask for the dim sum restaurant. If you go to some restaurants in the more local areas ask if they have an English menu. In such restaurants customers are often required to write their requirements on a tick-box sheet and hand them to the waiter.